In Europe, Christmas gifts are traditionally arranged underneath the Christmas tree but in some countries children wake up on Christmas morning all excited about the contents of… their socks. 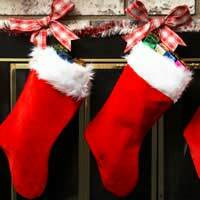 So what’s the deal with these Christmas stockings? There’s an old story that goes a little something like this: a nobleman with three daughters lost his wife and all of his money, forcing the four of them to live in a small house and abject poverty. When his daughters reached the age to marry, the situation turned increasingly desperate, as the father had no money for their dowries. Yet one night the young women hung their stockings above the fireplace so they could dry. The very same night, Saint Nicholas (his name would later evolve into Santa Claus), who knew of the family’s troubles, dropped by and noticed the stockings. He decided to help them, climbed onto the roof and dropped little bags of gold down the chimney, into the stockings. The next morning the girls found the gold in their stockings: now they could get married, and the whole family lived happily ever after. It’s a lovely story, and it gave rise to the tradition of hanging empty stockings over the fireplace on Christmas Eve. In some cultures the stocking is replaced by a shoe (this is generally the case for countries where Sinterklaas is still celebrated, like Belgium, Holland and France) or even a small box. Historically speaking the Christmas stocking custom began in Germany, where the socks were filled with five traditional gifts (one for each of the five senses): fruit (taste), noisy toys like rattles (sound), jewellery or something brightly coloured (vision), clay or clothes (touch) and perfume or cologne (smell). It was later exported to the “New World”, where the tradition caught on like wildfire. In 1822, Clement Clarke Moore wrote “The stockings were hung by the chimney with care, in hopes that Saint Nicholas soon would be there”, and a good fifty years later an illustrator called Thomas Nast drew a couple of stockings on a mantlepiece in George Webster’s Christmas book “Santa Claus and his Works”. Tie the ends in a knot at the top. We have some great ideas if you're looking for other Christmas decorations to make. I am a teacher and this topic will be useful for my lessons. My pupils are fond of Christmas like all kids. They like making stockings by their own.